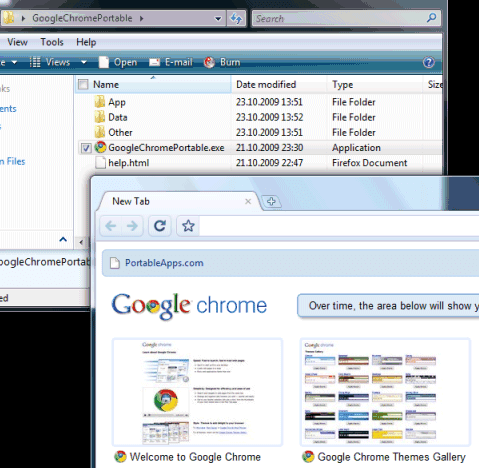 PortableApps.com started to offer a portable version of Google Chrome for Windows. Due to the licensing terms of Google Chrome, the site offers a small application that downloads Google Chrome's installer, extract its files and installs a portable launcher. Copy the resulting folder to a USB drive and you can launch Chrome on multiple computers without leaving traces. A much better idea would be to run Chrome using "roaming" profiles and save your settings and data online. Hopefully, Google Browser Sync will return in Google Chrome. There's already an experimental feature that synchronizes bookmarks with a Google account. Does it really leave no registry keys? I'm not so much interested in synchronizing my bookmarks with Google (or anyone else), I'd rather my Bookmarks menu access them directly (like GMarks for Firefox). We purposefully don't use roaming profiles because we can save an extraordinarily large amount of data in the profile. This is also tricky for sync. licensing prevents them from doing a normal portable app distribution? guess i'm glad i use portable iron instead of chrome. brother checks at the cookies and history he saw nothing!